Arachivitta sambar - This is yet another authentic dish of South India and is quite different from the regular sambar we prepare. As the name implies this recipe gets an impeccable flavor form the roasted spice powder and tanginess from the tamarind . 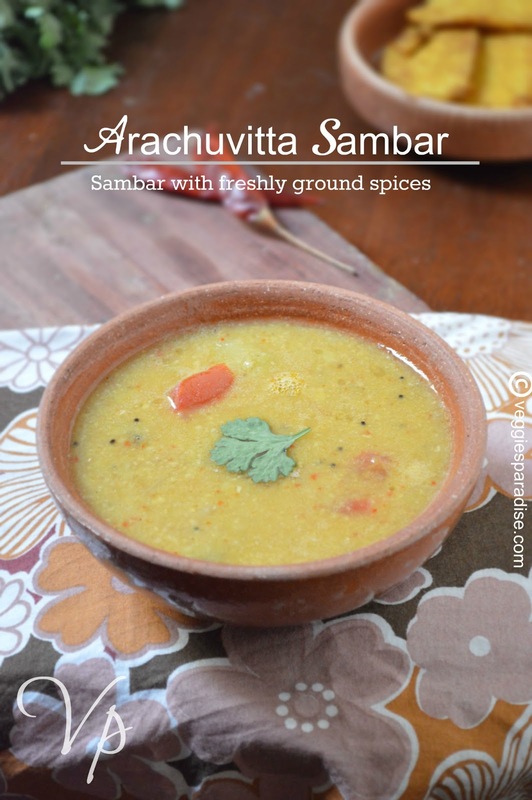 If you are bored with the usual sambar , then give this recipe a try. 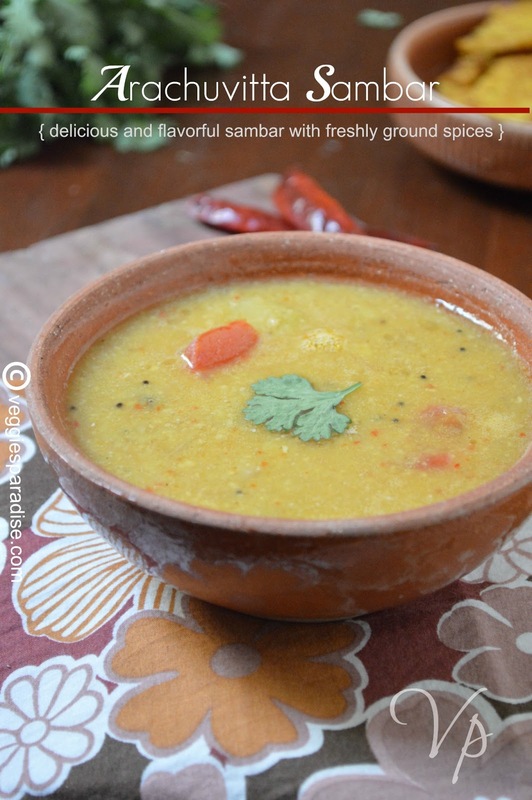 A perfect sambar comprises of thuvar dal cooked along with vegetables,tamarind extract and sambar powder. There are quite a lot of variations in preparing sambar, depending on the vegetables and the spices used , the taste also differs. Sambar powder, the key ingredient required for preparing sambar , is not required for this recipe. It is replaced with the freshly grounded spices of coriander seeds, dry red chillies, channa dal,coconut and urad dal.This is the variation to this sambar recipe,any vegetable of your choice can be used and I mostly prefer Drumstick,brinjal or yellow pumpkin. Serve it with Idli or Dosa or just plain rice. Pressure cook thuvar dal with a pinch of turmeric powder until soft and keep it aside. Heat oil in a pan and add all the ingredients listed under masala powder. Fry it on medium flame until fragrant, about 2- 3 minutes. Allow it to cool and grind them to a fine powder. Heat oil in a pan, add the mustard seeds. When they crackle , add the urad dal, curry leaves and asafoetida. Stir for a min. Add the chopped onions and fry it until soft. Now add the cooked thuvar dal and tamarind extract to it and allow it to boil for a couple of minutes. Finally stir in the grinded masala along with salt gently and add water if needed,let it boil for few more minutes in a low flame. Arachuvitta sambar is ready to be served. 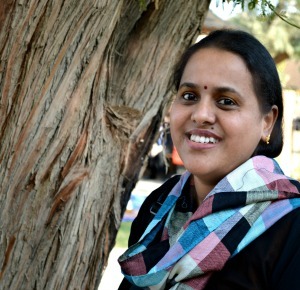 Hi Aruna was thinking it is long since any recipe came from ur side.Hope u r doing good. Yummy looking healthy sambhar...looks so invitinig. Glad to see u back Aruna, fingerlicking sambar, love it to the core. 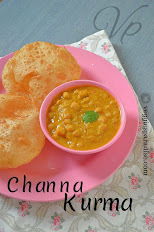 Welcome back Aruna..This sambhar looks delicious and flavorful.. This sambhar made with freshly ground spice is sounding delicious. Topping of coconut oil on the sambhar with Hot idly :) OMG i am feeling that i am in heaven ! different way to prepare but still delicious.love to see you at my space too. Love this sambar, nice clicks..